Columbus Machine Works originated from an interest in metal-working which quickly evolved into a love of machinery. The owner, Mike Stacey, was always intrigued by the way things worked and how things were made. After obtaining a Bachelor of Science in Industrial Design, he gained a variety of experience in different jobs and eventually accepted a position at Kaiser Machine Works, a venerable machine shop located in Downtown Columbus. 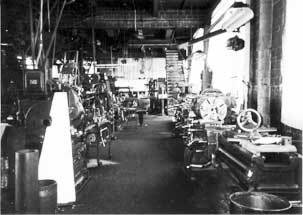 Kaiser Machine Works was established in 1902, and it was there that Mike acquired his first shop-floor experience, and developed his interest in machinery and traditional machine shop manufacturing. He also gained his appreciation for the history and design of antique machinery and its contribution in developing industry. At Kaiser Machine Works, Mike quickly advanced from machinist to management. When the company decided to shutter the business in 1997, Mike Stacey opened the doors of a small machine shop with one antique lathe, a milling machine and a drill press. Drawing upon his experience from Kaiser Machine Works, and his industrial design education, Mike has crafted Columbus Machine Works into the company it is today by being able to offer unique problem-solving skills, while providing quality machining with attentive, down-to-earth customer service. In 2005, Diana Stacey sold her graphic design business (mesh design + communication, inc) in order to join Columbus Machine Works and support the company's growth. With her contributions, the company has been growing steadily, and been able to provide additional services and capabilities to our customers. Today, our talented work force is proud to offer both conventional machine shop and repair services, as well as short to medium-run CNC manufacturing, and welding and fabrication. Kaiser Machine Works was established circa 1900, and provided services to the prospering Brewery District. Admiring the consideration which was given to the aesthetics of antique machinery was only natural given Mike's industrial design background. His mechanically-inclined spirit also created a natural attraction to the history and development of machine tools, methods of production and the advancement of machine tool manufacturing. Unavoidably, an interest in antique machinery often evolves into the labor of restoration. Mike has spent many years in the pursuit of preservation and restoration of historically significant and mechanically interesting machinery and devices. This pursuit (obsession) has taken him coast to coast and eventually led to his latest involvement in designing and manufacturing the MADE Lathe, an ornamental turning rose engine. For more information about this machine, please visite our website dedicted to it at www.madelathe.com.